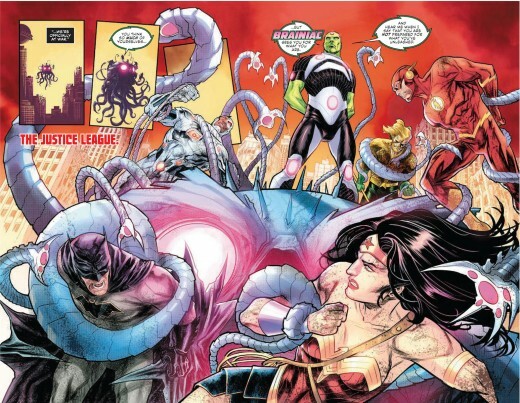 The Justice League reached towards the far end of the Universe to defeat Barbatos and his army from the Dark Universe. In doing so, cosmic gods beyond the Source Wall was able to detect energies of sentinel life in their Universe. With a new threat emerging to destroy the Universe, can heroes and villains band together to defeat the Omega Titans? Justice League: No Justice is another “world-building” story from Snyder which is, somewhat, similar to what he did in Batman New 52. In this new series, Snyder will make readers question their knowledge about the DC Universe by pouring it into an ocean filled with big sharks and unknown threats. The story is well written and has potential to be the definitive Justice League story of all time. 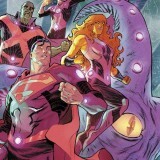 Snyder and company have the high aspiration for No Justice, but they get off on the right foot with this first issue. While there are a lot of characters involved in No Justice, the writers gave enough spotlight to each and everyone of them. No character was under-utilized nor was there any character that was over-used. Dialogues, interactions, and moments were equally distributed to highlight their strengths and weaknesses. The ending of the first issue is an engaging cliffhanger and just enough to create a lot of buzz to get fans to read the story. 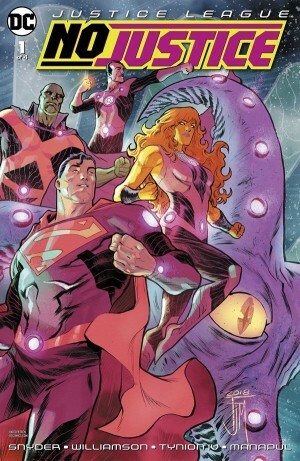 No Justice is probably Manapul’s greatest work, up to this date. Even without the thought and speech bubbles, readers can easily understand the story and get to feel the emotion behind everything. Sequencing and panel transition is unbelievable! It is the best I’ve seen in a long time. Manapul’s play of thick and thin lines adds depth to his artwork and gives a 3-D effect to most of the page spreads. The dynamic poses he used makes his artwork more appealing. Hi-Fi’s colors further compliment Manapul’s line art with his vibrant and bright colors. Darker hues of the same color were used to give more emphasis on the depth of the artwork. Cover page and interior artwork is nothing short wonderful. Overall, No Justice did not disappoint. It was even better than what we expected from this story. Considering the premise of the story and the overhaul they are introducing in the DC Universe, this book might be a good investment for comic book flippers. For comic book fans and readers, this is a book you would want to be part of your collection. To sum it up, Justice League: No Justice #1 is a masterpiece.